CPS-1 w/Q-Sound Capcom PCB dead battery repair. All the games mentioned on this page are copyrighted works and property of Capcom Co., Ltd. This information is being provided free of charge and is intended for people who rightfully own these games and want to repair them or prevent them from failing. 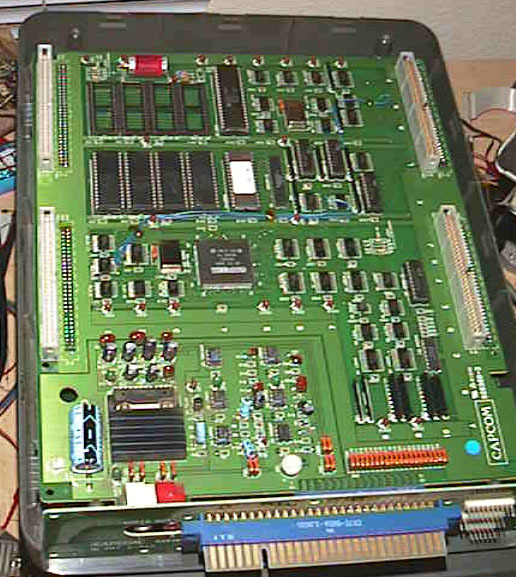 Either a 74LS02 and a 74LS08 or a 4002 chip. The first thing to do is open the case for your board if it has one. 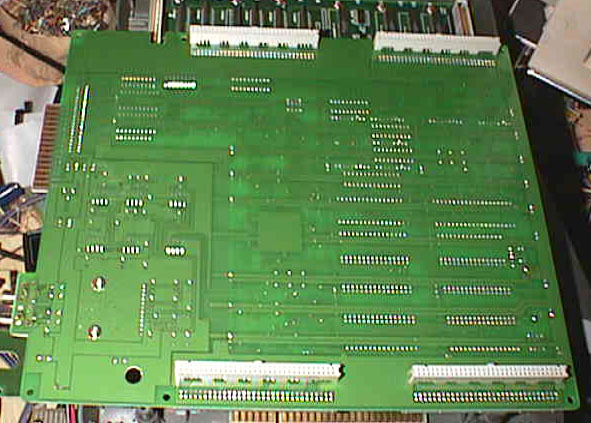 You'll see that there's a stack of three large PCB's joined with four connectors on each board. You'll need to remove the top board to get to the area you'll be working on. Next you'll want to remove the battery. Use your wire snips to snip the connectors and throw the battery away (I reccommend flicking it). ***WARNING*** These batteries contain lithium, which is an extremely volitile substance. If you puncture the battery, it will spray nasty liquid on you, your board and the surrounding area. In a matter of seconds, it will start eating whatever it landed on. Skin, PCB, clothes, eyes, whatever! That said, just be careful not to cut the battery off the board too close to the battery and you'll be fine. 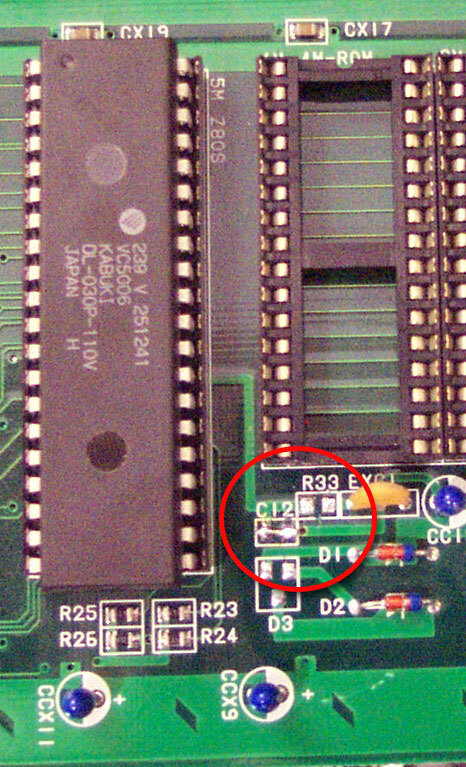 Next you'll want remove the capacitor at location C12 and the resistor at location R33, seen in this picture. Next, add a jumper across C12 as shown in this picture. This makes the Kabuki behave like a normal Z80B. 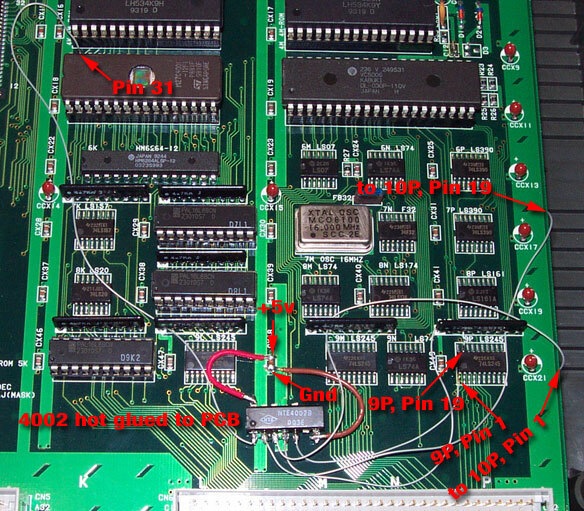 Next you'll want to burn a 27C020 EPROM with the correct data for your game. Choose the appropriate link below to download the correct file for your game. 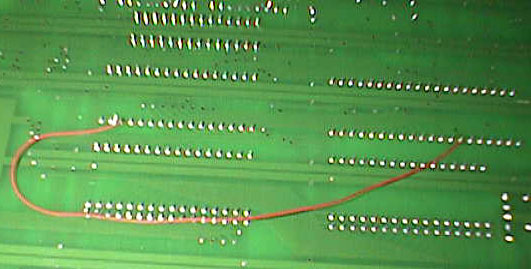 NOTE: The files provided above are intended for use in repairing broken circuit boards. They are not games and are not useable with game emulators, so don't bother downloading them if that's what you're hoping for. Once the new EPROM is burnt, remove the EPROM that's right above the Kabuki and replace it with the 27C020 you just burned. Next, you'll need to remove the middle board you've been working on, flip it over and prepare to solder. First you want to cut the trace going from pin 30 of the 27C020 to pins 31 and 32. Then, you want to solder a wire from pin 27 of the Kabuki to pin 30 of the 27C020. That's it! Put it all back together and your board should boot and play like new and you never have to worry about the stupid Q-Sound battery dying again! Yay! On Saturday Night Slam Masters/Muscle Bomber, Capcom took things a little further by having the main CPU perform some checksums on the Kabuki's encrypted code ROM to make sure it hasn't been modified. To get around this, we need to fool the main CPU into thinking the original encrypted code is still there. Therefore, we'll need to burn an EPROM that contains both the encrypted code and the decrypted code and do some additional hackery. If you don't perform this additional fix, the games will start to boot, showing their warnings, then will display a screen full of garbage afterwards. 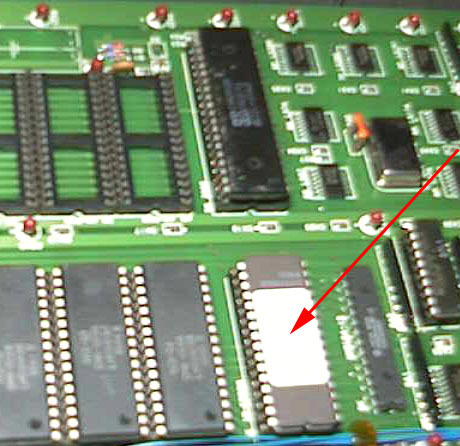 After performing the same steps as for the other games, instead of using a 27C020, choose one of the two files below and burn it onto a 27C040 EPROM instead. Once the new EPROM is burnt, remove the EPROM that's right above the Kabuki and replace it with the 27C040 you just burned. In addition to cutting the trace between pin 30 and pin 31 in the fixes for the other games (see above), also cut the trace from pin 31 to pin 32. Do still run the wire from pin 27 of the Kabuki to pin 30 of the 27C040. Now comes the fun part. You'll need to create a little circuit to be able to determine when the main CPU is checking the Kabuki's ROM and switch to the original encrypted code when that happens. You can build the circuit a couple of different ways. The easiest is to use a 4002 (Quad-input NOR), but you may not have any of those laying around, so you can also use a 74LS02 and a 74LS08. 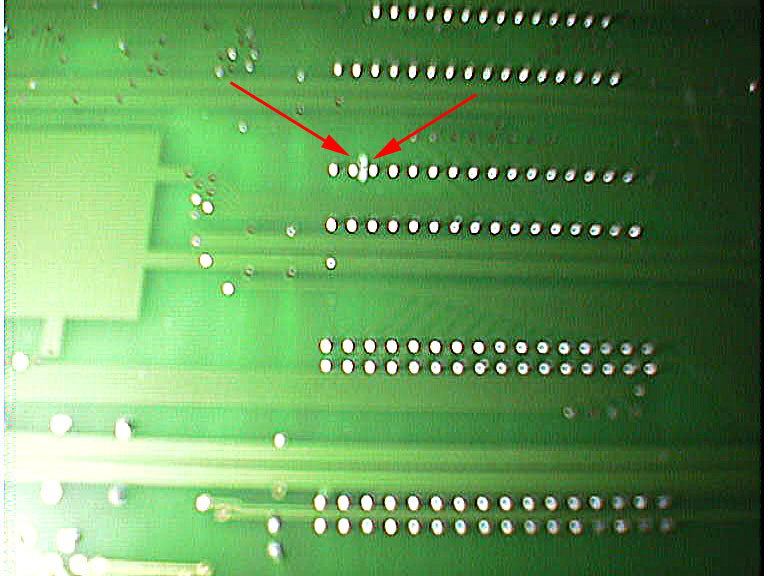 Locate the chip marked 74245 at location 10P on the A-Board. 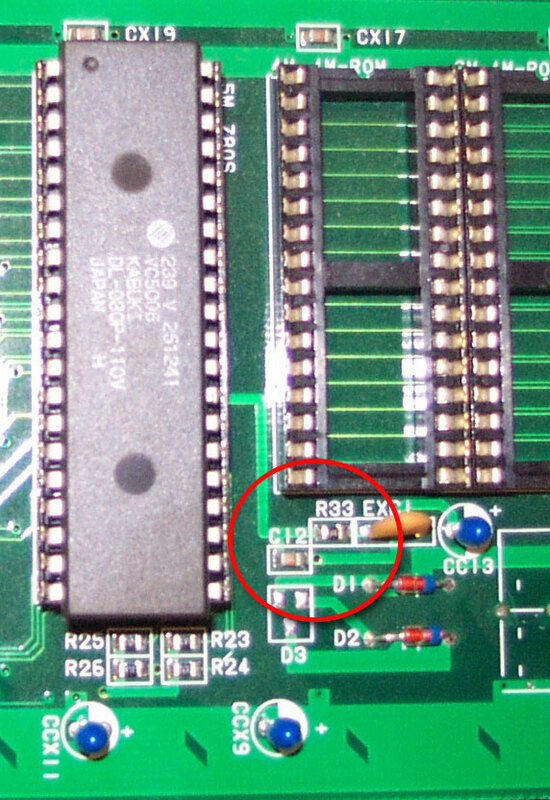 Run a wire from pin 1 of that chip to pin 3 of a 4002. Now run a wire from pin 19 of the 74245 to pin 2 of the 4002. Now, locate the chip marked 74245 at location 9P on the Q-Sound board. 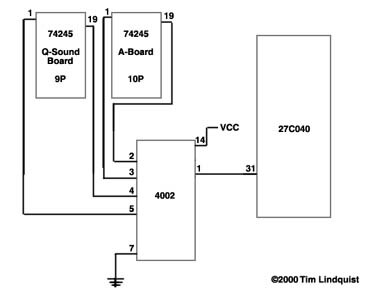 Run a wire from pin 1 of that chip to pin 5 of the 4002. 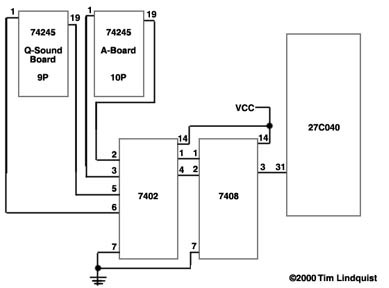 Now, run a wire from pin 19 of the 74245 to pin 4 of the 4002. 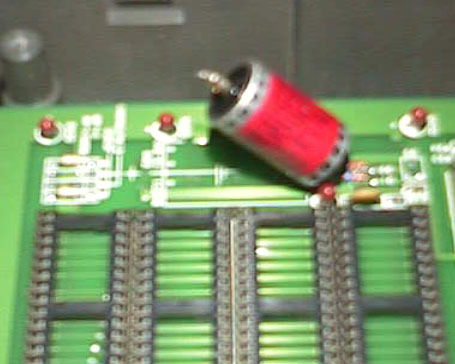 Lastly, run a wire from pin 1 of the 4002 to pin 31 of the 27C040. Don't forget to connect +5 to pin 14 and pin 7 to ground on the 4002. Click here for a diagram. Locate the chip marked 74245 at location 10P on the A-Board. Run a wire from pin 1 of that chip to pin 3 of a 74LS02. Now run a wire from pin 19 of the 74245 to pin 2 of the 74LS02. Now, locate the chip marked 74245 at location 9P on the Q-Sound board. Run a wire from pin 1 of that chip to pin 6 of the 74LS02. Now run a wire from pin 19 of the 74245 to pin 5 of the 74LS02. Now, run a wire from pin 1 of the 74LS02 to pin 1 of a 74LS08. Next, run a wire from pin 4 of the74LS02 to pin 2 of the 74LS08. Lastly, run a wire from pin 3 of the 74LS08 to pin 31 of the 27C040 eprom. Don't forget to connect +5 to pin 14 and pin 7 to ground on both the 7402 and 7408. Here's a picture of the finished mod. The Kabuki might be dead. Try using a known-good Z80B. The EPROM you programmed could be bad. Did you verify after burning? Try another. 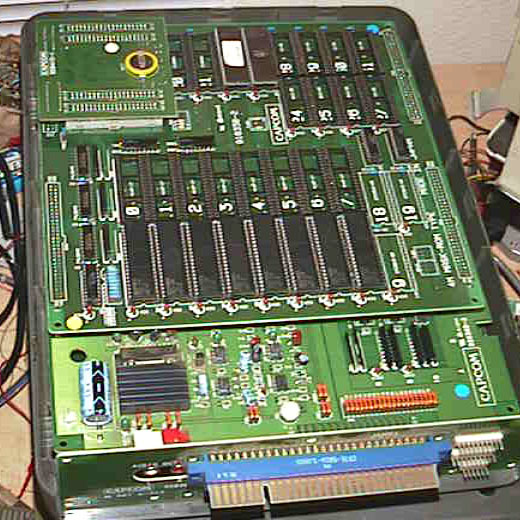 The data burned into the new EPROM may not be the right data for your game. Verify that you're burning the correct file. The version of the game you have may be different from the one these files were made to work with. If your game still does not boot after completing all the steps, this may be the case. You can email me and I'll try to help you. It's likely that you'll need to read one of your EPROMs and send me the file to look at. The trace between pin 30 and pin 31 must be completely severed. Cut hard! Test with a volt meter to make sure there's no continuity between the pins with no chip plugged into the socket. The battery on the upper-most board (the c-board) could also be dead or have lost power at one time. Return to the main page for details on fixing that one.